First multi-locus sequence typing scheme for Arcobacter spp. Arcobacter spp. are a common contaminant of food and water, and some species, primarily A. butzleri and A. cryaerophilus, have been isolated increasingly from human diarrheal stool samples. Here, we describe the first Arcobacter multilocus sequence typing (MLST) method for A. butzleri, A. cryaerophilus, A. skirrowii, A. cibarius and A. thereius. A sample set of 374 arcobacters, including 275 A. butzleri, 72 A. cryaerophilus, 15 A. skirrowii and 8 A. cibarius isolates from a wide variety of geographic locations and sources, was typed in this study. Additionally, this sample set contained four strains representing a new Arcobacter species, A. thereius. The seven loci used in the four-species Arcobacter MLST method are the same as those employed previously in C. jejuni, C. coli, C. helveticus and C. fetus (i.e. aspA, atpA(uncA), glnA, gltA, glyA, pgm and tkt). A large number of alleles were identified at each locus with the majority of isolates containing a unique sequence type. All Arcobacter isolates typed in this study contain two glyA genes, one linked to lysS (glyA1) and the other linked to ada (glyA2). glyA1 was incorporated into the Arcobacter MLST method while glyA2 was not because it did not increase substantially the level of discrimination. No association of MLST alleles or sequence types with host or geographical source was observed with this sample set. Nevertheless, the large number of identified alleles and sequence types indicate that this MLST method will prove useful in both Arcobacter strain discrimination and in epidemiological studies of sporadic Arcobacter-related gastroenteritis. A new Arcobacter MLST database was created http://pubmlst.org/arcobacter/; allele and ST data generated in this study were deposited in this database and are available online. The genus Arcobacter is a member of the Gram-negative, ε-Proteobacterial subdivision. The majority of isolated arcobacters belong to one of three species: Arcobacter butzleri, A. cryaerophilus or A. skirrowii. Additional members of this taxon include: A. cibarius, isolated from broiler carcasses ; A. nitrofigilis, a nitrogen-fixing organism isolated originally from estuarine plant roots ; A. halophilus, isolated from a hypersaline lagoon ; Candidatus Arcobacter sulfidicus, a sulfide-oxidizing marine organism ; A. mytili sp. nov., isolated from mussels ; A. thereius sp. nov, isolated from pigs and ducks  and A. marinus sp. nov . Arcobacter butzleri, A. cryaerophilus, A. skirrowii and A. cibarius have been isolated often from both animals [8–10] and food sources [10–13], water and agricultural runoff [10, 14–16], and domestic pets . The prevalence of arcobacters in food, raw milk and water would suggest a potential for food- or water-borne Arcobacter-associated human illness. Arcobacter spp., primarily A. butzleri and A. cryaerophilus, have been isolated from human diarrheal stool samples [18–22]. However, no direct connection between consumption of Arcobacter-contaminated food or water and human illness has been established, although it is likely that transmission of arcobacters occur via these routes. Arcobacter spp. have been isolated also from the stools of healthy humans [20, 23]. Thus, while host predispositions such as age and immune status may play a role, it is possible that some A. butzleri and A. cryaerophilus strains are non-pathogenic and are human commensals. The presence of a subset of non-pathogenic strains alongside pathogenic strains within A. butzleri, A. cryaerophilus and perhaps the other food- and water-associated Arcobacter species, such as A. skirrowii and A. cibarius, would indicate a need for an accurate typing method to distinguish human-pathogenic and human-commensal arcobacters. Arcobacter typing methodology would also be useful in studies of transmission routes and source tracking during outbreak and extended epidemiological investigations. Typing of Arcobacter strains using such methods as enterobacterial repetitive intergenic consensus (ERIC)-PCR, pulsed field gel electrophoresis (PFGE) and amplified fragment length polymorphism (AFLP) analysis has been reported (reviewed in ). Multilocus sequence typing (MLST), a typing method based on partial, yet defined, sequence information at seven housekeeping loci, was developed first within the ε-Proteobacteria for C. jejuni . It has proven useful for strain characterization, lineage identification and C. jejuni epidemiology (reviewed in ). Within Campylobacter, MLST methods are available also for C. coli [26, 27], C. lari , C. upsaliensis , C. helveticus , C. fetus  and C. insulaenigrae . The existence of multiple MLST methods within a genus provides insights into much broader areas, such as the degree of horizontal gene transfer between species and bacterial evolution and speciation within a genus; MLST can provide additional, clarifying genotypic information for a novel or potentially novel species . Development of the non-jejuni Campylobacter MLST methods was assisted by the availability of draft C. coli, C. lari and C. upsaliensis genomes . Construction of degenerate primer sets, based on alignments of these genome sequences at the seven MLST loci, permitted extension of the MLST methods into two species, C. insulaenigrae and C. helveticus, for which no genomic information existed [27, 29]. Similarly, the existence of the recently completed A. butzleri strain RM4018 genome , as well as a draft genome of A. halophilus strain LA31B (Miller et al., unpublished data), provided useful information for the development of an MLST method suitable for typing of Arcobacter species. Here, we describe a new MLST method for multiple Arcobacter species, including the three most frequently-isolated Arcobacter spp., A. butzleri, A. cryaerophilus and A. skirrowii. The Arcobacter MLST gene set is identical to the C. jejuni gene set (i.e. aspA, atpA(uncA), glnA, gltA, glyA, pgm and tkt), permitting phylogenetic comparison of data across the two genera. A sample set of 374 isolates of diverse geographic origin and source was typed in this study. Almost 300 sequence types and 1176 alleles across seven loci were identified. In order to optimize cross-species and cross-genus comparisons, the four genes (atpA(uncA), glnA, glyA and tkt) common to the Campylobacter MLST methods described previously [24, 26–29], together with the three additional loci (aspA, gltA and pgm) present within the C. jejuni method , were targeted in the Arcobacter MLST method. For optimal phylogenetic comparison, the same allelic endpoints were considered. Development of the Arcobacter MLST method was assisted by the concurrent completion of the A. butzleri strain RM4018 genome sequence . Gene sequences for the seven C. jejuni MLST loci were extracted, where applicable, from the existing Arcobacter and thermotolerant Campylobacter genome sequences, and aligned. Degenerate primers, situated approximately 300 bp upstream and downstream from the allelic endpoints, were designed and 94 Arcobacter strains (i.e. 69 A. butzleri, 21 A. cryaerophilus and 4 A. skirrowii) were amplified and sequenced. Sequence information from this sample set was aligned and used to construct the butzleri-specific primers listed in Table S1 [see additional file 1]. For the non-butzleri species, some loci did not amplify efficiently, using primers based on the Campylobacter/Arcobacter alignments. 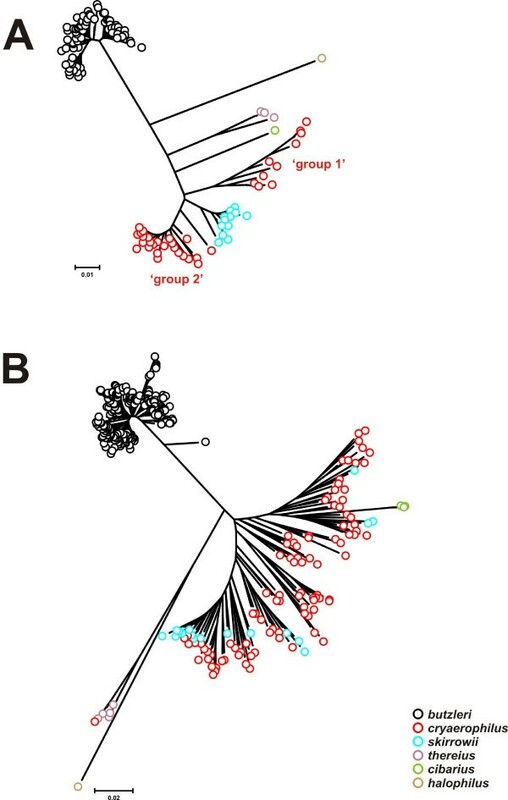 For these loci, improved primer pairs were constructed by incorporating sequences from the draft A. halophilus genome (Miller et al., unpublished data) into the Campylobacter/Arcobacter alignments. These improved primer pairs efficiently amplified the seven MLST loci (i.e. aspA, atpA, glnA, gltA, glyA, pgm and tkt) of A. cryaerophilus and A. skirrowii [see additional file 1 - Table S1]. Initial typing of the Arcobacter sample set at the glyA locus resulted in mixed sequencing reads for some strains, suggesting that at least two glyA genes might be present. The presence of multiple glyA genes was confirmed later upon completion of the A. butzleri strain RM4018 genome . In this strain, two nearly-identical, complete glyA genes are present in the genome, one (glyA1) linked to lysS and the other (glyA2) to ada. Therefore, to eliminate generation of mixed traces, amplification primers were designed within the lysS and ada genes. PCRs using the lysS and glyA reverse primers amplified specifically glyA1 and PCRs using the ada and glyA forward primers amplified specifically glyA2. All Arcobacter isolates typed in this study contained at least two glyA genes, suggesting that the presence of multiple glyA genes is an unusual feature common to the genus. The glyA locus in other Campylobacter MLST methods is also linked to lysS. For this reason, and for the fact that the glyA2 locus is less discriminatory than glyA1 (see below), the lysS-linked glyA1 locus was incorporated into the Arcobacter typing method. To address the ability of the Arcobacter MLST method to amplify successfully as many A. butzleri strains as possible, we wanted a large sample set with broad geographic origins and sources. A description of the Arcobacter isolates by geographic origin and source is listed in Tables 1 and 2. A total of 275 A. butzleri isolates were typed, as well as an additional 99 isolates representing other Arcobacter species, e.g. A. cryaerophilus and A. skirrowii [see additional file 2 - Table S2]. All 366 A. butzleri, A. cryaerophilus, A. skirrowii and A. thereius isolates amplified and sequenced successfully with one or more of the primer pairs listed in Table S1 [see additional file 1]. Arcobacter cibarius demonstrated variable tkt amplification results, i.e. weak amplification of some loci with each primer pair and no primer pair amplifying all loci [see additional file 1 - Table S1]. Geographic origin of the Arcobacter strains typed in this study. Source of the Arcobacter strains typed in this study. A large number of Arcobacter MLST alleles and sequence types (STs) were identified in this study (Table 3). Allelic density (i.e. no. alleles/no. strains) ranged from approximately 30% (111/374) at the glnA locus to 63% (236/374) at the glyA1 locus. The high density of alleles translated also into a large number of STs (Table 3). Among the 275 A. butzleri isolates characterized in this study, 208 STs were identified. In fact, among all of the Arcobacter STs, no more than five strains were determined to possess the same ST and 228 of 374 strains (61%) contained unique STs. A large percentage of variable sites were identified at all of the Arcobacter MLST loci (Table 4). Arcobacter cryaerophilus and A. skirrowii strains contained the highest number of variable sites per locus, relative to the number of alleles identified, and the largest number of variable sites for all species occurred at the glyA and/or pgm loci. Arcobacter alleles and sequence types. Diversity of Arcobacter alleles and sequence types. b. Ratio of non-synonymous to synonymous sites. c. An additional 53 and 37 variable sites are present within the aspA and glnA loci, respectively, when A. skirrowii ST-243 is included in the calculations. The d n /d s ratio (i.e., the ratio of substitution rates at non-synonymous and synonymous sites) was substantially < 1 for all of the MLST loci characterized in this study (Table 4), ranging from 0.000 at A. butzleri gltA to 0.181 at A. skirrowii tkt. These low values for the Arcobacter MLST loci are consistent with those described previously for Campylobacter [24, 27, 29], indicating that those loci in both genera are not subject to positive selection. The presence of a large number of MLST alleles within the Arcobacter sample set might indicate that the Arcobacter MLST alleles are genetically unstable, prone to change either by accumulation of point mutations or horizontal gene transfer. Four A. butzleri type strain isolates, obtained from different labs and including the genome sequence strain RM4018, were typed in this study. In addition, 17 related strains, isolated after passage of the A. butzleri type strain through swine, were also typed. As expected, all 21 strains were the same sequence type, ST-1, and contained the same glyA2 allele (data not shown), suggesting that A. butzleri STs are relatively stable, even after passage through a food animal. Within each of the aspA, atpA, glnA, gltA, pgm and tkt loci, phylogenetically discrete clusters were identified that associated with species (data not shown). An example is illustrated in Figure 1A for the atp locus, showing that the A. butzleri, A. skirrowii, A. thereius and A. cryaerophilus alleles form distinct groups. However, for the latter species two separate clusters, termed here 'group 1' and 'group 2' were observed. Two phylogenetically-distinct clusters of A. cryaerophilus alleles were identified also at the glnA, gltA, pgm and tkt loci [see additional file 2 - Table S2], but not at the aspA locus that formed only one cluster. The existence of species-associated clustering at these six loci permits tentative identification of lateral transfer events. These events were not observed in A. butzleri because no alleles related phylogenetically to other species were identified, however, alleles related phylogenetically to those identified in A. butzleri were identified within A. cibarius and A. skirrowii (i.e. tkt-90, tkt-91, aspA-73 and glnA-1). 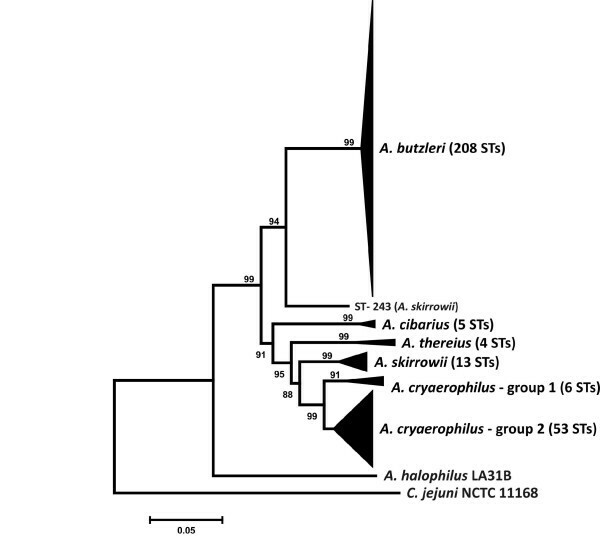 Similarly, A. skirrowii alleles were identified within A. cryaerophilus and A. thereius ( e.g. aspA-125 and glnA-95), and an A. thereius allele was identified in A. cryaerophilus (glyA-306; see Figure 1B). Lateral transfer events identified by MLST have been reported previously [27, 32]. Dendrograms of Arcobacter atpA and glyA alleles. A: atpA; B: glyA. The dendrograms were constructed using the neighbor-joining algorithm and the Kimura two-parameter distance estimation method. The scale bars represent substitutions per site. The A. halophilus strain LA31B atpA and glyA sequences were extracted from the draft A. halophilus genome. Note the presence of a putative laterally-transferred allele within the A. thereius glyA cluster. Clustering of the glyA alleles (including alleles at both glyA genes) is noticeably different from clustering at the other six loci (Figure 1B). Here, as at the other six loci, the A. butzleri and A. thereius glyA alleles form separate clusters distinct from the alleles of the other characterized arcobacters. However, the glyA alleles of A. cryaerophilus and A. skirrowii are indistinguishable phylogenetically, with the A. cibarius glyA alleles forming a deep branch within the A. cryaerophilus/A. skirrowii cluster. Additionally, the A. cryaerophilus/A. skirrowii glyA cluster is highly divergent, relative to the A. cryaerophilus and A. skirrowii clusters at the other MLST loci. Phylogenetic analysis of the Arcobacter STs, following CLUSTAL alignment of the concatenated allele sequences for each unique profile, indicated that these STs clustered also by species (Figure 2). Arcobacter thereius profiles formed a clade distinct from A. skirrowii and the other Arcobacter species, providing additional evidence that the strains within this clade are exemplars of a novel Arcobacter species. Two groups of A. cryaerophilus profiles were observed: 'group 1' and 'group 2' profiles were composed primarily of 'group 1' and 'group 2' MLST alleles, respectively. Based on SDS-PAGE analysis of whole-cell protein extracts and 16S restriction fragment length polymorphism analysis, two subgroups within A. cryaerophilus were identified by Kiehlbauch et al. and Vandamme et al. [33, 34]. These A. cryaerophilus subgroups differ also in their fatty-acid composition, specifically in the amounts of 16:1 cis 9 and 16:1 trans 9 fatty acids , and in their AFLP profiles , although they are not differentiated by DNA:DNA hybridization analysis . Only 7 of the 72 A. cryaerophilus strains in this study were characterized previously at the subgroup level by either AFLP or whole protein profiling [see additional file 2 - Table S2]. However, the subgroup identities of these strains did not correlate well with the MLST groups. Considering these results, it is possible that the cryaerophilus subgroups identified by Vandamme et al. are not analogous to the MLST groups identified here, although additional investigations will be necessary to resolve this issue. Condensed dendrogram of unique Arcobacter STs. For each unique ST, the profile allele sequences were extracted and concatenated. The concatenated allele sequences were aligned using CLUSTAL X (ver. 2.0.5). The dendrogram was constructed using the neighbor-joining algorithm and the Kimura two-parameter distance estimation method. Bootstrap values of >75%, generated from 500 replicates, are shown at the nodes. The scale bar represents substitutions per site. The tree is rooted to C. jejuni strain NCTC 11168. The A. halophilus strain LA31B concatenated sequence was extracted from the draft A. halophilus genome. 'Group 1' A. cryaerophilus sequence types include: ST-209, ST-220, ST-221, ST-231, ST-232 and ST-270. As described above, Arcobacter strains contain two unlinked glyA genes in their genomes. The ada-linked glyA2 alleles are less discriminatory than the lysS-linked glyA1 alleles: incorporation of glyA2 into the typing scheme in place of glyA1 would result in 197 STs for A butzleri, instead of 208, and 58 STs for A. cryaerophilus, instead of 59. Therefore, this reduced level of discrimination was one of the reasons why the ada-linked glyA2 locus was not incorporated into the Arcobacter MLST method. Additionally, inclusion of both glyA loci in the Arcobacter MLST method, thus creating an eight-locus typing scheme, would not increase significantly the discriminatory power of the seven locus method. A large number of STs contain different glyA1 and glyA2 alleles: for example, the A. butzleri genome sequence strain RM4018 contains the glyA-1 allele at the glyA1 locus and glyA-142 at the glyA2 locus [see additional file 2 - Table S2]. The presence of two highly-similar glyA loci is an unusual feature of the Arcobacter genomes and multiple copy genes are not generally members of MLST schemes. However, the data suggest that despite the presence of two glyA loci within every strain, the Arcobacter glyA loci are remarkably stable. There is no compelling evidence in this study (with the possible exception of ST-240) of gene conversion events between the two glyA genes (manifesting as the presence of both identical and different glyA1/glyA2 alleles within an ST), and only one putative lateral transfer event was identified at glyA. Therefore, inclusion of glyA1 in the typing scheme is merited, since the large number of glyA alleles identified in this study would substantially enhance Arcobacter strain discrimination. The large number of MLST alleles and STs identified in this study indicates that the Arcobacter MLST method described here is useful for strain discrimination for the three major Arcobacter species, i.e. A. butzleri, A. cryaerophilus and A. skirrowii, as well as two additional Arcobacter species, A. thereius and A. cibarius. Additional genomic sequence data should permit revision and expansion of this typing method into additional Arcobacter species. No association, with either host or geographical source, of Arcobacter alleles or STs was observed in this study; however, the large suite of alleles and STs present within this sample set make identification of such associations difficult, since most alleles and STs were observed infrequently. Typing of additional Arcobacter isolates, thereby increasing potentially the numbers of each allele and ST, may reveal heretofore undetected association patterns within this genus. The increasing association of arcobacters with human illness, transmitted potentially by contaminated food or water, makes this method a valuable addition to Arcobacter typing. This method should prove useful in investigations of sporadic and outbreak arcobacterioses and Arcobacter epidemiology. The A. butzleri set typed in this study consisted of 275 isolates from 16 countries across four continents (N. America, Europe, Asia and Africa), and from a wide variety of food sources and animals (Tables 1 and 2); additionally 102 strains (37%) were isolated from both healthy and diarrheal human stool samples [see additional file 2 - Table S2]. Furthermore, to assess the versatility of the Arcobacter MLST method in typing strains of non-butzleri species, we assembled a set of isolates from four other Arcobacter species: A. cryaerophilus, A. skirrowii, A. cibarius and A. thereius. The size and scope of the non-butzleri sample set was limited necessarily by the relatively few isolates available for the non-butzleri species. Nevertheless, 99 non-butzleri isolates were assembled. The majority of these were A. cryaerophilus (N = 72) and A. skirrowii (N = 15), obtained predominantly from cattle and swine; the remainder included eight A. cibarius strains and four A. thereius strains. A large number of strains in the Arcobacter strain set were of unknown origin (N = 57; 15%). All Arcobacter strains were cultured routinely under aerobic conditions at 30°C on Brain Heart Infusion agar (Becton Dickinson, Sparks, MD) supplemented with 5% (v/v) laked horse blood (Hema Resource & Supply, Aurora, OR). Arcobacter halophilus was grown on Brain Heart Infusion -blood media supplemented with 4% (w/v) NaCl. PCR enzymes and reagents were purchased from New England Biolabs (Beverly, MA) or Epicentre (Madison, WI). All chemicals were purchased from Sigma-Aldrich Chemicals (St. Louis, MO) or Fisher Scientific (Pittsburgh, PA). DNA sequencing chemicals and capillaries were purchased from Applied Biosystems (Foster City, CA). PCR and sequencing oligonucleotides were purchased from MWG-Biotech (High Point, NC). MLST primer sets are listed in Table S1 [see additional file 1]. Each MLST amplification mixture contained: 50 ng genomic DNA, 1 × MasterAmp PCR buffer (Epicentre, Madison, WI), 1 × MasterAmp PCR enhancer (Epicentre), 2.5 mM MgCl2, 250 μM (each) dNTPs, 50 pmol each primer, and 1 U Taq polymerase (New England Biolabs, Beverly, MA). PCRs for MLST were performed on a Tetrad thermocycler (Bio-Rad, Hercules, CA) with the following settings: 30 cycles of 94°C for 30 sec, 53°C for 30 sec, and 72°C for 2 min. Amplicons were purified on a BioRobot 8000 workstation (Qiagen, Valencia, CA). Cycle sequencing reactions were performed on a Tetrad thermocycler, using the ABI PRISM BigDye terminator cycle sequencing kit (version 3.1; Applied Biosystems, Foster City, CA) and standard protocols. Cycle sequencing extension products were purified using BigDye XTerminator (Applied Biosystems). DNA sequencing was performed on an ABI PRISM 3730 DNA Analyzer (Applied Biosystems), using POP-7 polymer and ABI PRISM Genetic Analyzer Data Collection and ABI PRISM Genetic Analyzer Sequencing Analysis software. The Perl program MLSTparser  was modified to create the program MLSTparser3. The new features of MLSTparser3 include: 1) incorporation of the MLST schemes for C. fetus, C. insulaenigrae and the novel Arcobacter MLST schemes described in this study, in addition to the original MLST schemes for C. jejuni, C. coli, C. lari, C. upsaliensis and C. helveticus; 2) automatic association of allele with species, based on phylogenetic analyses of the ten MLST loci present in the different Campylobacter/Arcobacter MLST methods, permitting immediate identification of chimeras; and 3) automatic assignment of sequence type (ST), based on the profile of seven MLST alleles. Novel alleles and STs are flagged by MLSTparser3 and assigned an arbitrary number. MLSTparser3 was used to identify the MLST alleles and ST of each Arcobacter strain typed in this study. A new Arcobacter MLST database was created http://pubmlst.org/arcobacter/; allele and ST data generated in this study were deposited in this database and are available online. Variable sites and calculation of the d n /d s ratios were performed using START2 http://pubmlst.org/software/analysis/. A dendrogram of unique Arcobacter STs was constructed by concatenating the allele sequences comprising each ST. Allele sequences for each strain were concatenated in the order aspA-atpA-glnA-gltA-glyA-pgm-tkt for a final composite length of 3341 bp; in addition, the MLST alleles of the A. halophilus strain LA31B were extracted from the draft genome (Miller et al., unpublished data), concatenated and incorporated into the ST analysis. Sequence alignments were performed using CLUSTALX (ver. 2.0.5; http://www.clustal.org/), and dendrograms were constructed using the neighbor-joining method with the Kimura 2-parameter distance estimation method. Phylogenetic analyses were performed using MEGA version 4 . We thank Wayne Muraoka for technical assistance in the culturing of arcobacters and in the isolation of genomic DNA for this study and also thank Jeri Barak for critical reading of the manuscript. This work made use of the Arcobacter MultiLocus Sequence Typing website http://pubmlst.org/arcobacter/ developed by Keith Jolley at the University of Oxford . WGM designed the research project. WGM designed the MLST primer sets, analyzed the MLST data, performed the phylogenetic analyses and was the principal author of the manuscript. GW and EY isolated the Arcobacter genomic DNA, and GW and EY performed the multilocus sequence typing. IVW, SLWO, KH, FM, AS and CJM isolated the Arcobacter strains and performed the initial characterization/speciation of the isolates. All authors approved and read the final manuscript.